Angel Rae Salvage - Global Diving & Salvage, Inc.
A live-aboard wooden fishing vessel, Angel Rae, sank at its moorage on the Duwamish River in Seattle, WA. 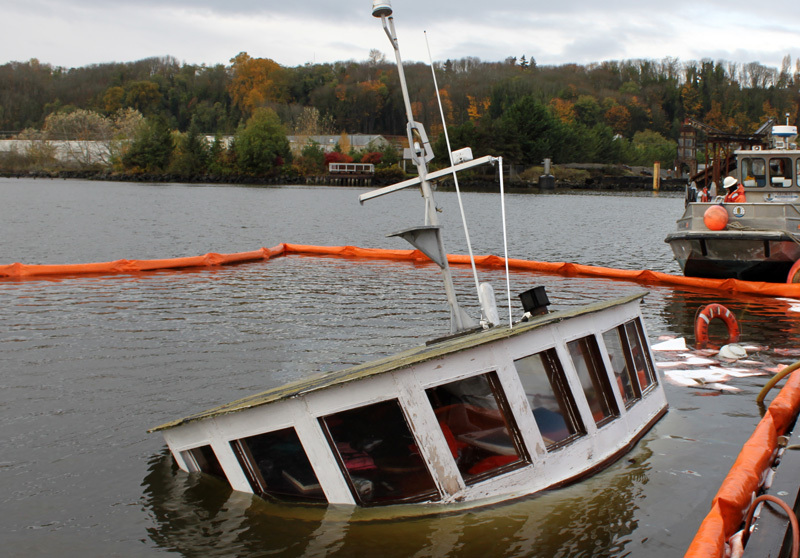 Global Diving & Salvage, Inc. was contracted by the Department of Ecology to mitigate any potential fuel release as well as raise the vessel and remove it from the water. Containment boom was deployed around the vessel and various locations around marina to mitigate the spread of fuel in the river current. The fuel vents and caps were sealed and the vessel was defueled. The vessel was rigged for lifting by a diver. A derrick was brought to the site to lift the vessel off bottom. Once on the surface, water was pumped from the hull. After being dewatered, the Angel Rae was removed from the water and taken to a shore side yard while custody of the vessel was transferred. Once authorized, all HAZMAT materials were removed and the vessel was demolished.